Thanks to the Zsnes and Cherryroms forums crew for the information. The Pro Action Replay is a cheat device, similar to the Game Genie, except that it changes RAM addresses instead of ROM addresses. Also unlike the Game Genie, the codes are not encrypted, so it makes changing a code much less of a hastle. 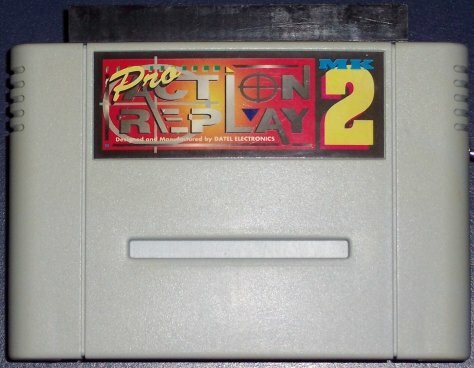 The original version allowed you to input up to 3 codes, but the Pro Action Replay 2 allowed up to 255 codes to be saved. Codes work when the Snes tried to read the address, rather than when the snes tried to write on the address, which made it so some codes did not work properly all of the time. The PAR2 also had a slow motion feature, which played each frame of the game twice. The Pro Action Replay also worked as a converter which bipassed the regional lockout chip. This meant you could play NTSC games on a Pal snes and vice versa.